For all the parents out there who have been sleep deprived I’m sending you virtual hugs! For all the parents whose children have slept through the night since only a few weeks old and have two plus hour naps all day every day, I want to BE you! Seriously, if you are the latter congratulations on hitting the child jackpot but the next time you have a conversation with a sleep deprived parent and they ask how your child is sleeping, lie to them and then give them a big hug! I’m fairly certain every parent has been sleep deprived at some point. It ain’t fun. In fact it is simply the worst in my opinion because it is a physical and emotional process to go through. You can read about our sleep problems with Sydney in this post. In fact, it was almost a year ago that I wrote that post. Now we’re onto baby number two and if I’m telling the truth I think I have post traumatic stress from trying to tackle naps with Sydney. I get anxious just thinking about a nap schedule for Brayden and despite the fact that he is most certainly my chill baby and exhibits no signs of “I will not nap for you ever” I can’t help it. Hubby and I have a great routine down for Brayden at night. It’s a team effort and I thank my lucky stars that my husband is right by my side whenever our little guy does wake up. It isn’t simply on me to get up and feed him and get him back to sleep and just knowing that I have backup if/when I need it is pretty amazing. BUT we’re actually not here to talk about our two month old and how he sleeps (he sleeps awesome, by the way!) No, we are still here talking about Sydney who is now a little over two years old! Say whaaaaat? She still sleeps in her crib (woot woot!) and she was sleeping through the night fairly regularly and napping well for some time. She went through some pretty normal regressions and had a stage where she was scared of things and would call out to us but other than that we were doing well! Towards the end of my pregnancy I think she knew something was up. Things were going to change and I think a little jealousy set in. She started waking up a few times a night requesting back rubs or hugs or even just to talk about something totally random. She was stalling and making excuses for us to come in. And how do you refuse when they cry to you for a hug??? Ohhhh it’s so hard. But once Brayden was born waking up any more than we already had to was simply out of the question. We were zombies. He would eat every few hours and then Sydney would call to us and wake us in between. Not to mention SHE wasn’t getting as much sleep as she needed. So, enter the sleep chart. Now Sydney thrives on routine. And she loves to please. She also loves to be rewarded for good behavior. 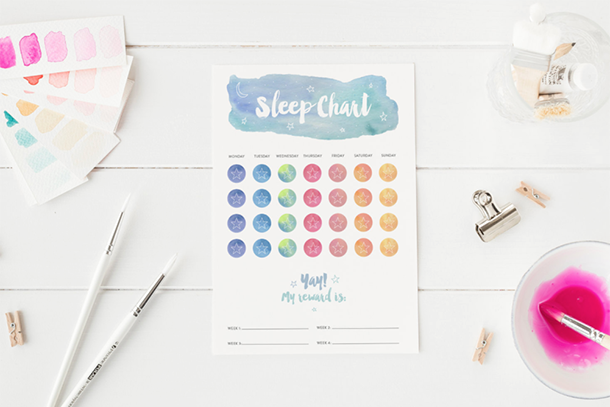 So I designed a sleep chart after doing some reading. She got a gold star for every good night of sleep where she didn’t call out to us. We explained that we don’t come into her room at night unless something is wrong and we picked a reward to work towards together. The first week she had a couple of nights where she still called out to us and cried. We would go in and explain that she wouldn’t be getting her gold star if she cried for things like hugs or water (she has a cup of water by her bed and she would ask for more even when it was full). 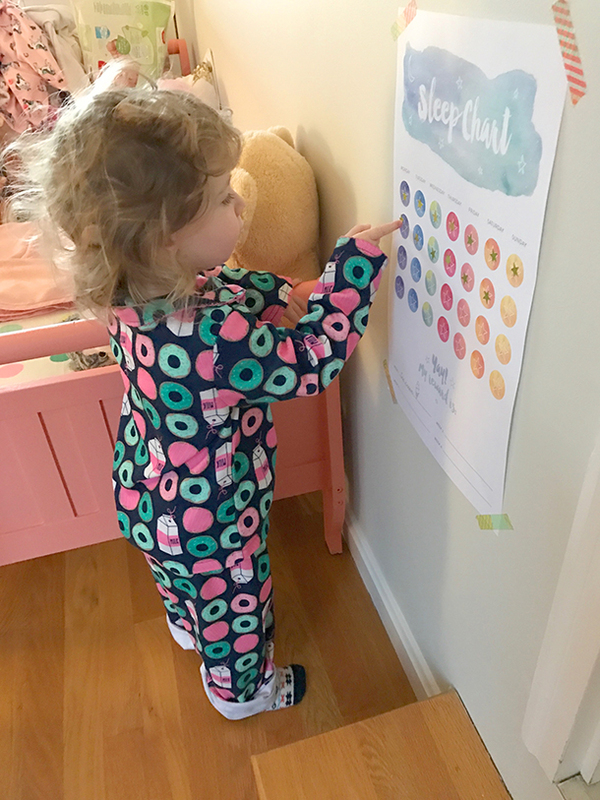 She realllly wanted those gold stars and we made a BIG deal out of putting them on her chart every morning that she had good sleep. After her first week of good sleeping we took her to Friendly’s for ice cream (the reward that she chose!) and we made a huge deal out of it. It was a special lunch date with her own big ice cream sundae and she was thrilled! AND she knew she earned it by sleeping well and putting herself back to sleep if she woke up. The second week she didn’t call out to us at all. She got a new Peppa Pig book as a reward. The third week her reward simply became putting the gold stars on the chart. It was now a part of our routine. 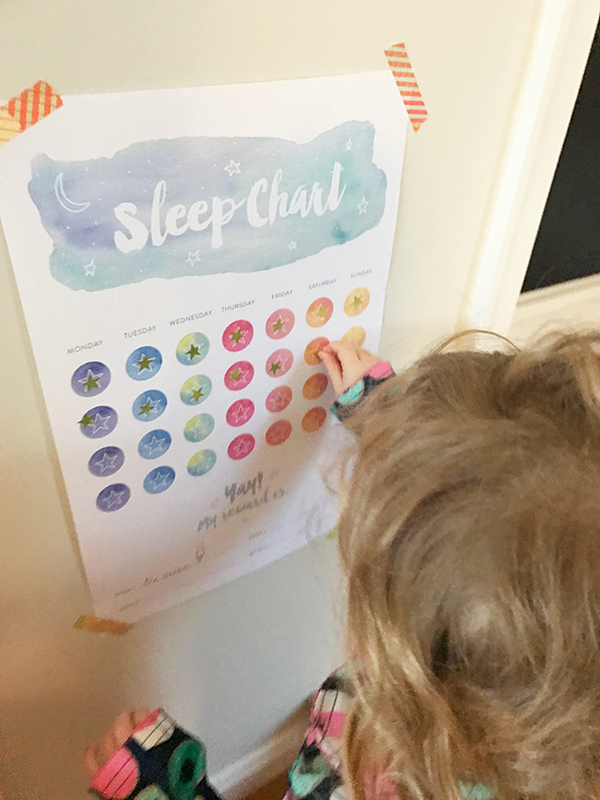 We phased out the “big rewards” and she’s been sleeping like a champ! But she still loves those gold stars!